Full-featured and robust memory, I/O, and compute capacity in a power-efficient spread core design for intense datacenter applications. Expand your datacenter possibilities with systems built on the Intel® Server Board S2600WT, Intel’s premier server board family featuring power-efficient spread core design plus incredible 24 DIMM DDR4 memory, I/O, and compute capacity needed for data ...analytics or enterprise applications. 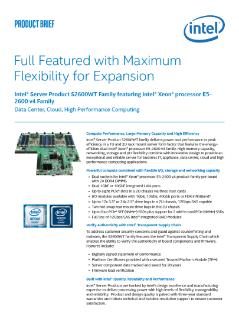 Designed to support the performance and features of dual Intel® Xeon® processors E5-2600 v4, Intel® Trusted Execution Technology, Intel® Xeon Phi™ coprocessors, and Intel® Solid-State Drives, systems include preconfigured 1 and 2U rack models, or disaggregate chassis and boards for greater flexibility.